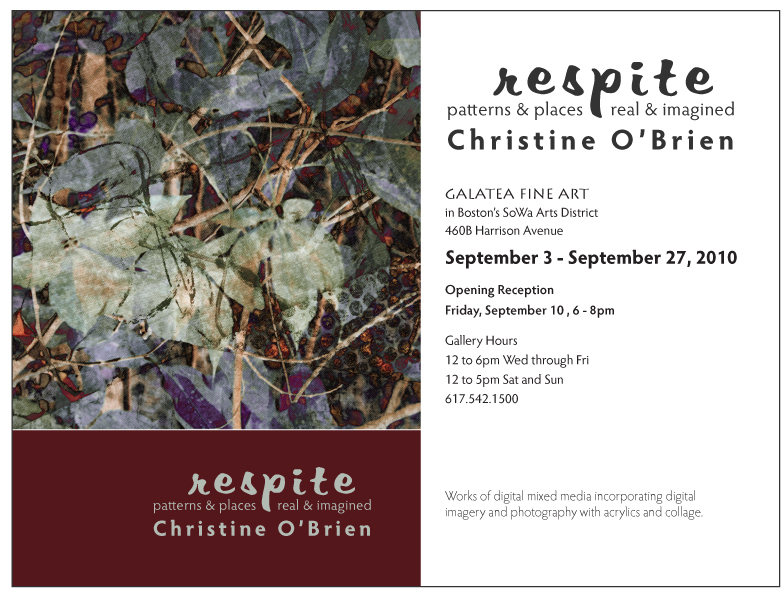 Yes it's summer and while vacation is foremost in my mind, I have also been hard at work preparing for my first solo show, coming up in September at Galatea Fine Art. The name "Respite: Patterns & Places, Real & Imagined" stems from feeling that everywhere I look, there are signs, directions, calls for action. Buy this, write your senator about that. Join our cause. Save the gulf (OK, this I happen to agree with). It's overwhelming. So when I create, I want to make art that allows my eyes to follow their own path, to formulate my own thoughts, and find my own meaning. I want to get lost in a visual where I can hear myself think, where there is no specific agenda. This collection of digital mixed media has at its core digital photography, which I shot in places as varied as the White Mountains of New Hampshire, and the streets of New York City (yes, those vacation places are always foremost in my mind!). Inspired by nature, even in the city, I've layered many of these images together in Photoshop until a new composition is derived. Rather than a literal replication, I've tried to create a memory of the patterns, colors and senses I felt during the visit. The hybrid artworks incorporate this digital imagery and photography with acrylics, collage, and other media through an intuitive process of experimental and alternative printmaking techniques. 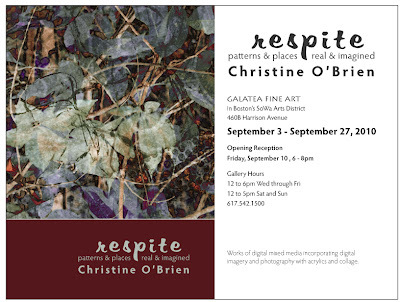 The exhibit runs from from September 3 - 27, 2010 at Galatea Fine Art in Boston's South End. An opening reception is scheduled for Friday, September 10 from 6 - 8pm coinciding with the South End First Friday celebration. Hope to see you there! !